Celebrate Mother’s Day with our creative worksheets and printable art projects that will help kids honor that special woman in their lives and warm mom’s heart! From heartfelt letters and poems to coloring pages and paper flower bouquets, little ones and older kids alike can create something they’ll be proud of to show their mom just how much they love her. Your little artist can make a perfect picture for a special person with this colour by number page! While she's coloring, she'll also be practising numbering. Exercise your beginning writer's creativity and sentence-building skills with this fun family project, all about mom! On Mother's Day, don't just celebrate your mom -- learn all about her with this All About My Mom book! 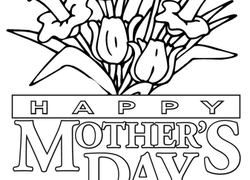 With this fun Mother's Day coloring page, your child will have not only a fun coloring project, but a beautiful card to give Mom on the special day. Identify Mother's Day on a calendar, then create a picture to share with a mother you know. Show Mom some love with a unique poem created just for her. Use the letters in the word "mother" to start each line in your poem. 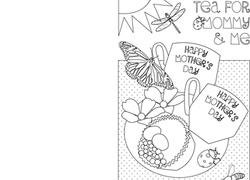 Greeting cards don't have to be store-bought, and this printable makes creating a homemade Mother's Day card even easier with a pretty design to colour in! What could be more fun than a day at the park with your tot? 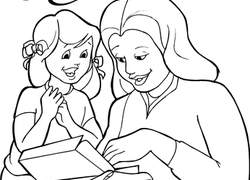 Take the crayons and this coloring page to the park and colour it with your preschooler. Mothers come in all shapes and sizes, and your kindergartener will have fun coloring this mother bunny and her little ones! What better way to celebrate mom on her special day? Share some breakfast in bed with your kids on Mother's Day. 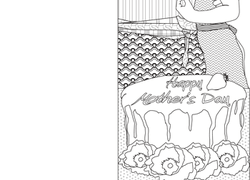 Make mom's special day extra-colorful with this coloring page greeting! Help your child decorate this page with her favorite colors. Celebrate mom with a special mini-book created by your little learner! He'll fill out the pages with things all about mom. Nothing says "I love you" like a handwritten card. 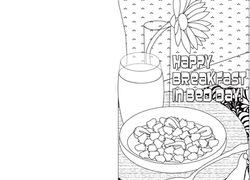 Sweeten Mom's day with a little made-by-you card filled with pretty patterns and delicious breakfast in bed. In this worksheet, kids will be able to practise composition skills, all while answering questions about a very important subject: Mom! 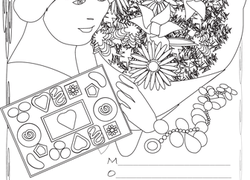 Celebrate Mother's Day with this fun and festive coloring page, which features a mother opening a Mother's Day gift from her young daughter.